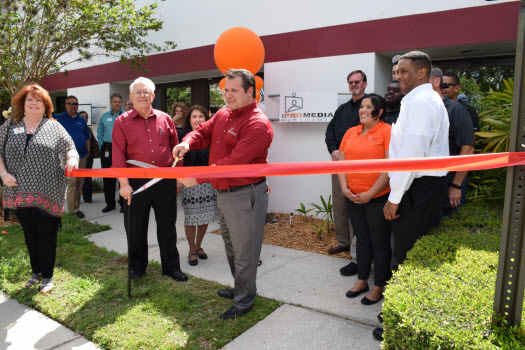 The ProMedia Group of Tampa FL recently celebrated their Grand Opening April 20th at their new location in Tampa Florida at 4897 West Waters Ave. Suite F Tampa FL. 33634. The event was held April 20, 2017 from 3pm to 6pm. The event was celebrated by many longtime clients and new clients as well as many others interested in the latest audio visual technology. During the Grand Opening there was a live demonstration of the outstanding 110 inch Panasonic VF1H video wall. Many of the attendees commented that it was very impressive. Ken Avis notes, "We were so happy to see such a tremendous turnout to help us celebrate our Grand Opening here in Tampa Florida. It was great to see old collegues who we have worked with in the past, and some who are interested in out innovative audio visual products. Many have heard about The ProMedia Group, and this gave us a opportunity to show them what we do, how we do it and how our services can benefit them. We are proud to be on the leading edge of the latest technology and we were very happy to demonstrate that new tech during out Grand Opening at our new location in Tampa Florida." The Grand Opening began at 3pm with a ribbon cutting ceremony led by Ken Avis of The ProMedia Group and Jerry Peruzzi of the Upper Tampa Bay Chamber of Commerce. There was a large turnout to help participate in the ribbon cutting ceremony that celebrated the opening of The ProMedia Groups new location. The ProMedia Group is one of Florida's premier Audio video providers. Working with the latest technology in the Audio/Visual field, The ProMedia group enjoys helping companies communicate better with high definition video conferencing or provide better privacy with their installations of Cambridge soundmasking systems. The ProMedia Group takes great pride in providing the best customer satisfaction in the Audio Visual industry. In business since 2009 The ProMedia Group is available to Consult, Design and Integrate the best audio-visual solutions for Tampa Bay’s corporate market, including audio systems, background music systems, sound masking systems, video conference systems, custom video wall displays, digital signage networks, presentation environments, corporate training rooms, interactive displays, digital signage and video walls. Call 800-881-6887 for more information or visit The ProMedia Group for more information http://TheProMediaGroup.com.